We all know that caulk has many practical uses around the home, such as sealing cracks and protecting joints from water damage. But did you know that caulk also serves a decorative purpose? With the proliferation of pre-colored, tintable and paintable caulk options, as well as the increase of tile and stone treatments in showers, bathtub surrounds and kitchen backsplashes, caulk has become an important part of home décor. However, it’s impossible to discuss the aesthetics of caulk without also discussing its functionality. Here’s a primer on both to help with your next caulking project. First things first, is there a difference between grout and caulk? In a word, yes! Grout—which often is cement-based—is harder and more durable than caulk but less flexible. It also needs to be sealed to be watertight. Caulk, on the other hand, is more flexible and provides excellent water protection. In a tiled shower situation, grout typically would be used between tiles while caulk would be used in the joints between tile “planes” and abutting surfaces (around the bottom of the shower, for example). Because caulk is often color-matched to grout, it’s sometimes difficult to distinguish between the two. For every caulking project, select a high-quality caulk and caulking gun to achieve the best results. Also, be sure to choose a caulk for its intended purpose. 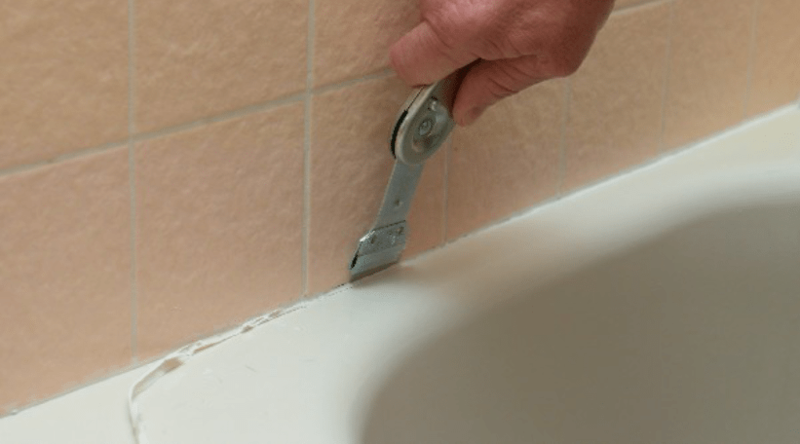 When caulking around tubs and sinks, for example, it’s important to select a caulking product designed for that purpose because it offers extra water resistance as well as mold and mildew protection. The same is true for windows and doors, masonry and concrete, and so on. Also, be sure to choose the formulation that best suits your needs and skill levels. There are three types of common household caulks. Latex is relatively inexpensive and easy to tool and clean up. Silicone costs more and is more difficult to apply but also is more durable over time. Polyurethane is more expensive but extremely durable. It also is messier to work with and must be cleaned up with solvent. Before loading a caulk cartridge and engaging the gun, read the instructions carefully on both products. If you’re caulking for the time, run a few test beads on cardboard first or have a professional painter or tile-setter do the work. Professionals know how to lay a perfect bead every time. Here’s where the decorative part comes in! White and clear caulks were the standards for eons, but there are endless possibilities today with pre-colored, tintable and paintable caulk options. These products not only help to seal cracks, joints and other areas but do so in a beautiful fashion. Pre-colored caulks allow you to choose a color right off the shelf that meets your needs. It’s not unusual to see a dozen or more different colors on a retailer’s shelves—sometimes with matching grout, too. For many home applications, including craft projects, a pre-colored caulk will do just fine. For an exact match, you should consider tinted caulk. Caulk can be custom-tinted at a paint store, or you can tint caulk yourself—one cartridge at a time—with some of the DIY tinting kits available. Kits generally come with tools and instructions to mix latex paint into the caulk for a perfect match. Either way, tinting can give you caulk that matches, complements or contrasts with other décor elements, such as tile, stone, painted walls and so on. In a bathroom with gray painted walls and a white-tiled shower, the grout and caulk used in the shower might be tinted white to match the tile color for a seamless look. Or they could be tinted the exact gray color of the walls for a coordinated look. Or they could be tinted a dark gray or even black to define the tiles and add drama. Really, the sky’s the limit! And the resulting look is polished and high-design. Paintable caulk creates a similar polished look. By painting the caulk bead the same color as the surrounding walls, trim, siding, and other surfaces, you can make it a part of the color scheme. Paintable caulk is available in latex, water-based silicone and polyurethane formulations, which further opens up the possibilities of where you might use them. Many manufacturers offer paintable caulk in latex, acrylic silicone, and polyurethane formulations. Some of these formulations will need to cure first, however, before being painted. Check the cartridge or ask your local retailer how to achieve the best results.